Big Red Bad Call Brick - Huskers Etc. Last night during the NU vs Mizzou game, before the Husker’s comeback against the Tigers matched the largest fourth-quarter comeback in school history, there was quite a bit of tension among Nebraska fans. Discussion involved talking about a “Big Red Brick” that one remembered from his college days – a red foam life-like brick complete with holes that one could throw at the TV when a bad play was called. So today after 27-12 win, I decided to see if I could find such brick for the next game. 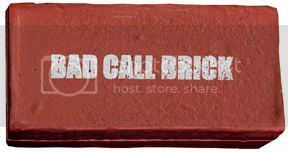 Amazon offers several Bad Call Bricks for sale. Now I’m considering ordering my own Corporate Logo Foam Bricks to promote this very Husker website and hand out – who would want one?? Hey guys, do you know where I can get those foam rubber bricks. I checked the link above, Things You Never Knew Existed and they don’t carry them. That was a great price. Any thoughts would be appreciated. Thanks! !